This session is short and sweet and includes beautiful images of you with the Eiffel Tower in all her glory in the background. This session is designed for those who really just want a couple of lovely images to take home as a souvenir of their trip. These sessions are only scheduled in the mornings to avoid the crowds around the Tower. 20 minutes, includes 20 edited full-resolution digital files and a print release. Trocadero area only, with exceptions on occasion at Pont Bir Hakeim. This session can be customized to add as few or as many hours as you want, as well as any number of locations, at any time of day. Want to hit all of Paris’ greatest landmarks? Want something more residential – the “real” Paris? Want to traipse across the City of Light at night? This session can accommodate anything and everything! We’ll provide suggested locations and itineraries depending on the style you’re looking for. Includes 40 edited full-resolution digital files per hour of shooting and a print release. If you book a one hour Basic Session, we’d like to GIFT YOU A COMPLIMENTARY 15 MINUTES at Trocadero for the classic, iconic photos with the Eiffel Tower. If you’d like to take advantage of this special, please mention it when booking in order for us to accommodate for the extra time during scheduling. Session fees are due upon booking. For full pricing or more information, please contact us! Q: When do you recommend taking portraits? A: We strongly recommend morning sessions. The light is glowy and bright and soft and beautiful, there are very few people out so you don’t have to fight the crowds, you can avoid security guards who often hassle you at the Eiffel Tower or Louvre area, and once you’re done you’ve got the entire day free to sightsee or relax! Morning sessions are especially good for those husbands and boyfriends who aren’t entirely excited about taking portraits, because it doesn’t take a large chunk out of their day and they don’t have to be embarrassed by posing in front of large crowds of strangers. Generally we start these around 7 or 8 AM, though the recommended start time changes throughout the seasons. Afternoon and evening sessions usually result in substantially less photos, because we have to spend more time waiting for crowds to clear from the background. 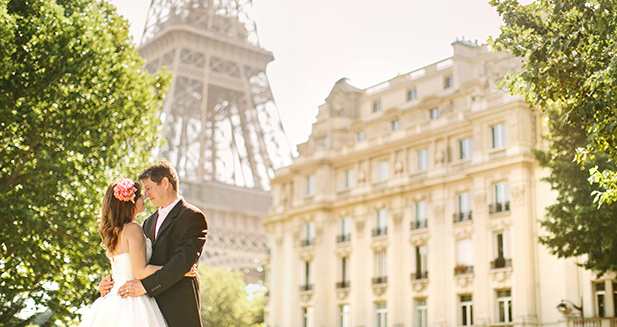 Q: Can we do the Mini-Session somewhere other than the Eiffel Tower? A: In some limited situations, we may be able to do mini-sessions at Pont Bir Hakeim upon request, but otherwise the mini-sessions are limited to Trocadero only. Q: Is there a difference between elopement pricing? If so, why? A: Weddings and elopements often require more time discussing logistics and more photography coverage the day of the event, which leads to more editing and sometimes more staff. Please inquire with us about the specifics for your event. We are happy to send you more information on the pricing. Q: Can you suggest places for us to take our portraits? A: Absolutely! When you book with us, we’ll send over our great location guide that lists our favorite locations and some sample images to give you an idea of your options. The right location(s) for you will depend on a variety of factors, including your personality, as well as the timing and weather for your session. There are some places that photograph better in the winter, or when it’s raining, or when it’s nighttime, or with couples who are wearing casual clothing, etc. If there’s a location that has special meaning to you, we definitely want to incorporate that as well. Q: Does travel time in between locations count against my session time? A: Yes, and this is why we recommend that you keep locations to a minimum or pick locations that are close to each other. A: In my opinion, Paris is the kind of place where you dress up. The architecture and atmosphere of the city is refined and elegant, as are the French people. Even if you consider yourselves “jeans and t-shirt” people, I suggest taking this as an opportunity to embrace your inner Parisian and go with something more formal or dressy. If you’re recently married, consider bringing your wedding gown and suit. Otherwise, companies like Rent The Runway in the USA or Ma Bonne Amie, Le Temps d’un Soir, and C’est Ma Robe in France offer you the chance to wear expensive designer gowns at very moderate prices. We also love TB Dress, SheInside, ModCloth, Simply Dresses, and Vogue Dresses for inexpensive formalwear. In the winter, layer thick thermal leggings under your dresses and consider a fur coat or wrap that will keep you warm and photograph nicely. The most important thing to keep in mind when selecting your outfits for the session is silhouette. What makes you look best is the curves that define your body. If your outfit (this includes jackets and overcoats, if you wear them in the photos) is baggy, loose, or ill-fitting, you’re not going to look your best, so choose something that shows off your curves rather than hides them. We are experts at using lighting, posing, and retouching to make our clients look amazing, so don’t worry about looking bad – it won’t happen! Q: Can I change outfits during my session? A: Yes, however places to change clothes are EXTREMELY hard to find in Paris. Usually you will have to go in a cafe and have a drink so that you can use their restroom to change. This can easily eat up 15-20 minutes of your session time, and that’s if there’s a cafe nearby. If not, it can take 30 minutes of your session time. It’s also a major hassle to carry around extra bags with a change of clothes for the entire session. Unless you really want two outfits, we suggest sticking with your favorite one. Q: What happens if it rains? Will we cancel the session? A: It rains very often in Paris. Typically it rains for just a few minutes, then clears up to a bright beautiful sky for a few hours, then back to rain, and so on. I recommend bringing a cute umbrella for your session that you don’t mind getting photos with, so that if it does happen to rain, we can embrace it and turn it into more portraits. See my post here for a long list of sturdy and photogenic umbrella suggestions. I also have a number of cute umbrellas I can bring for you to use (upon request). Otherwise, we can duck into a cafe for a quick drink until it passes. We can also reschedule if you feel it is necessary, depending on our schedule. A: We are very flexible with scheduling, and we do not charge any fees to reschedule your session, so if a conflict pops up, just let us know and we will adjust accordingly. Deposits are refundable until one week before the session. Q: Is there anything else we should bring for our session? A: Besides a cute umbrella and the balance of your session fee, make sure you’ve got comfortable shoes, as you’ll be doing a lot of walking. Ladies, if you choose to wear heels for your session, bring a pair of easy-on-easy-off flats that you can slip into as we travel between locations. Avoid anything with snaps, buckles, or zippers, as you don’t want to waste your session time constantly changing into and out of complicated shoes. Bring a cell phone so that you can contact me if you get lost or if you’re running late. You may also want to bring a small Ziploc or clutch with makeup for touchups. Otherwise – leave everything else at the hotel! Please DO NOT bring a big bag full of passports, cameras, and other valuable items that you might keep on you. When we stop to take photos, you’ll have to set that bag down and it will be unattended, and unfortunately some thieves do target photographers for this reason. I can keep a small sack inside my camera bag, but please leave any large bags at your hotel. Q: Can I pay in cash on the day of the session instead? A: Yes, we can arrange this if you prefer. See this page on our site for more information about banking and currency while traveling abroad. Q: Who will be shooting my session – CheyAnne or Doug? A: We cannot guarantee any specific photographer, as each person’s availability changes throughout the year. All of our photographers are heavily trained to shoot in the same style with the same editing, and we work very hard to make sure our work is consistent across all of our team members. If you like the work you’ve seen on our website, you’ll like your photos, too! Q: Can you edit my photos to look like _____? Can I get the RAWs or all of the unedited JPGs? A: No. Before you inquire with us, we ask that you look at our previous work and view some of the sample sessions on our site. If you like what you see, then you can trust that we will use our expertise and artistic vision to choose and edit the images in a way that are consistent with our other work. Before your session we will send you a questionnaire asking about your preferences, such as whether you prefer candid or posed images, whether you like romantic or playful images, your retouching preferences, etc. We will take your answers into consideration and do our best to accommodate them. However, if you are looking for a completely different shooting, lighting, or editing style, we suggest you seek out a different photographer whose style more closely matches your vision. Q: When and how will I get my photos? A: Once the images are finished, we will email you with a link to view the photos in an online gallery, a link to download the full resolution photos, and a personal use agreement that will allow you to have the photos printed on your own. Turnaround time ranges from 3-6 weeks depending on how busy we are. If you need a couple of images quickly for a special reason like a holiday card or announcement, let us know and we can send over a few sneak peeks within a week.